After recent changes to the National Rural Employment Guarantee Act (NREGA) administrative system that attempted to reduce corruption by reforming the processes between the Panchayat and the Centre, teething problems have been reported in the media. Leaving out the last mile disbursement problems with the NREGA, would you consider the new administrative system an improvement on the old one? If you look for something that has no possible downside, I think that is a way to be stuck with the status quo all the time. So, it could be that it is a bad system. Our evidence suggests it’s not. If it is a bad system, it won’t be because it has some problems somewhere but because it will be systematically worse than the other. Well, we can certainly do many things that tell us a lot about the implementation. The impact evaluation may not be at that scale — though ours was at the scale of all of Bihar, or half of Bihar, in fact. But the fact that the implementation in some places is faulty (and) the data didn’t get uploaded, this you can get from the Management Information System (MIS). So it’s not actually hard to do the evaluation. We can see how much of the MIS got recorded within three weeks, three months etc. How much lag was there? All of these are facts you could read off the MIS. So I don’t see a reason why we couldn’t evaluate it. If we were to systematically look at it, we could say (for example) 62 per cent of the muster rolls were uploaded within three weeks and another 25 per cent took six months. And if that’s true then we would be able to assess how well it worked. I don’t think this a reason to have radical skepticism about every possibility of improvement. That’s all our culture of criticising everything. It’s not that I like everything our government does. Typically, I don’t. But I think it is impossible to have change if the goal of the media is to find defects with everything from day one and not aggregate across outcomes. So, yes, there is a defect but five other things went well. You don’t hear the five other things that went well, you hear that there was a problem with Jharkhand. That’s often what you hear. My view is that that’s perforce true. There’s nothing…if you told me there was never a problem anywhere I’d say that you were lying. We do understand that implementation of Aadhar is very complex. Why do you think the government was in such a rush to institute Aadhar into almost every welfare programme? Well, I think there is a very clear problem which is that there are lots of ghost recipients and they wanted to get rid of such recipients, which is a perfectly legitimate concern. I think one of the things that Karthik Muralidharan’s paper shows is that the reason why they can save the money is because they actually find a bunch of ghost recipients getting the money. So I think that it’s clear what the government is hoping for. Maybe it has some other evil design. There’s always the possibility that they actually have something else in mind. But prima facie it’s legitimate to say that we are giving away 20 percent of the money to people who don’t exist, who are clearly undeserving. Why should we not try to improve? It seems like a prima facie legitimate argument to make. Then what’s going on inside their head I don’t know. Just to note that your paper also shows that the ghost workers were reduced by the administrative reforms. My point is only that there are lots of ghost workers and ghost days. Whether there are other ways to reduce it…. being able to send money to somebody if it says I have worked for 82 days rather than somebody else, it seems like a good idea. I don’t understand how the people who are against Aadhar conceive of the world when they argue that we shouldn’t worry about these things. On the other hand, I understand that we could be creating all kinds of structures of discrimination, and maybe we shouldn’t do it now. But the objective seems perfectly legitimate. By seeding Aadhar into almost every facet of economic activity and making it mandatory, the government could have unprecedented access to the economic lives of Indians. How should we think of the trade-off between the social benefits of Aadhar versus the potential for misuse? I think the potential for misuse doesn’t come from that particular thing, the private sector is much more likely to misuse it than the government. What you see is Facebook and Cambridge Analytica is misusing it. I think if the government wants to abuse its power it has much more straightforward ways. I think in India the government abuses its power all the time in many manifest ways. I want to make two points. One is that I think if I wanted to get data that is completely private about people, for example, what’s in the income tax returns, I could get it by bribing somebody. I think we should deal with the more mundane privacy issues rather than worry about whether or not…the government’s interest in data privacy violations seems weaker than the private sector. If somebody wants to hack into my account I doubt that the government is going to steal money from my account. I do think that there is a guy in Russia who would love to do it. So, I’m much more worried about the private sector than the government. This is not to say that any time I put a lot of data online that’s a risk. My second point is that, it’s not clear to me whether Aadhar makes it worse or better. Again, I don’t claim to be an expert on privacy. So I don’t want to be too emphatic on this. But it seems to me that if you added another layer of defense that per se…for example MasterCard data has been compromised. Go directly to MasterCard data and hack in it to it…. we live in a world where data privacy is a kind of a fantasy because it’s just too hard to do and everybody is trying to steal the data. And it seems to be that by using credit cards we are exposing ourselves to much more dangers than, per se, using Aadhar. I think there is a sense in which two arguments are being made. One is that the government should not know stuff about us. You know, the government knows tons of stuff about us, and if you look at the countries that have the most public records (they) tend to be the most liberal social democracies. Denmark, you can get generations’ history of everything they did, where they went to school, what incomes they earned, what jobs they had, what taxes they paid, all in the public domain. So, I don’t think of that as being oppressive state which is doing it. It’s a way of thinking about who we are and in a sense it’s a way to promote certain transparencies. So, I think one should be worried about this but one should start with a narrower question, which is not that I’m paranoid, the government is getting my data, it’s going to come and do bad things to me. The government does all kinds of bad things to you but it doesn’t need the data to do it. If it wants you to be the person it wants to attack, it controls the banking sector directly. Do you think that if it suddenly wanted some information it couldn’t call out the State Bank of India and get the data from them? I think they could get it. I suspect that Aadhar is a complete distraction in this conversation. You can listen to the podcast “Why Indian Democracy Doesn’t Deliver More?” here. 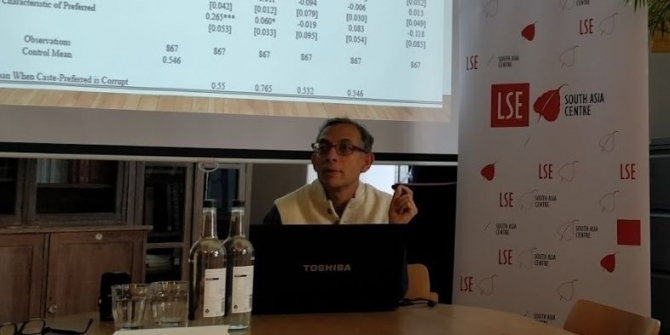 Abhijit Banerjee is the Ford Foundation International Professor of Economics at the Massachusetts Institute of Technology, and Director of the Abdul Latif Jameel Poverty Action Lab. He is co-author of Poor Economics (2011) with Esther Duflo, which won the Goldman Sachs Business Book of the Year award. Anshuman Tiwari is pursuing a PhD in Environmental Economics at the LSE, and holds a Masters degree in Public Policy from the University of California at Berkeley. He has worked at the World Bank in Washington, DC and as an adviser with the government of Delhi in improving budgetary practices and project management.